Old Spice Invisible Spray Antiperspirant and Deodorant goes on invisible to help protect against sweat and odor. It keep you feeling fresh for 48 hours. That's long enough to build a small house or navigate an especially large lake. 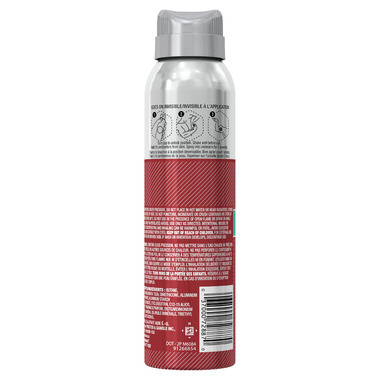 Old Spice Invisible Spray goes on invisible to help reduce white marks on skin or clothing. Pure Sport is the crisp, clean scent of achievement. Start your morning with a fresh, sweat-fighting spray that helps keep you protected all day. Avoid excessive inhalation. Avoid contact with eyes. Keep out of reach of children. For external use only. Do not use on broken skin. If rash or irritation develops, discontinue use.